Love the dirty feet in the first one...fun shots. 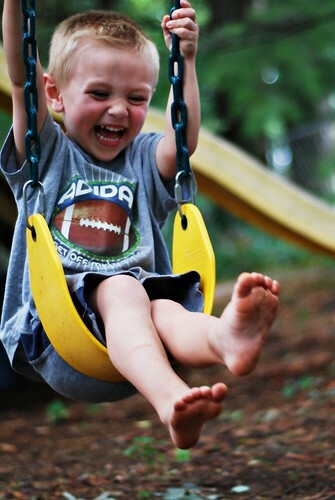 Somebody's having a blast on that swing! 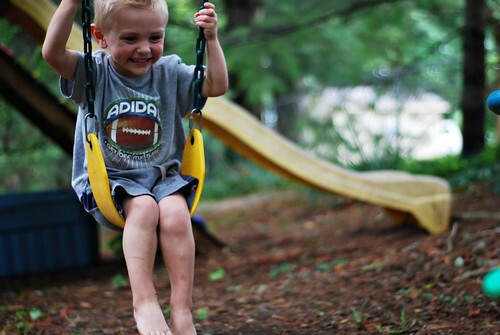 I love the hug grin and giggly expressions...and the dirty little feet, too. I love the shot of his feet, but oh that smile!!! love the dirty feet shot & that smile is pure joy! amazing that you caught those with manual focus -- kudos! He looks like he is having SO much fun. :) Great shot! Although I have to admit I love the feet in the first shot. Great work! I can totally feel his glee, and I appreciate your effort to manually focus. I am glad AF works wth my camera for prime lenses! The last one is great, but I also love those toes in the first one. Wow! That first one is my favorite! All are awesome...I love the nifty-fifties!!! I agree with Christina, though...manual focus with little ones? THAT is a feat! Great job! You ROCK! Can't believe you were able to get these shots from the manual lens. I love the little feet. 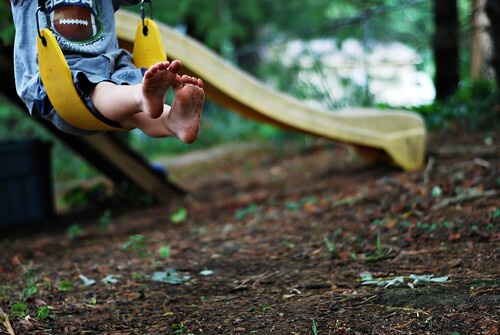 I'd totally zoom in and crop a photo just of the feet, they're so cute! I love the new title for your blog. I am really looking forward to trying the recipes from your menu for this week. Thanks for posting! I'm not sure which one I love more -- the first one or the last one! You did such a great job -- and you're right, that last shot shows pure joy perfectly! these could not be cuter. great job capturing the true joy of life! dirty feet and all. Those are fantastic! (catching up from yesterday, sorry!) I got a 50mm lens a few months ago and have had similar frustrations. My AF actually does work with prime lenses, but I do feel like I'm really working for a lot less "good" shots!